I am a lover of all things carbohydrate – bread, web pasta, more about rice, potatoes – they all have a special place in my heart (and my stomach). I shudder at the outrageous thought of a low-carb life. The Atkins diet makes me cringe. I would rather run an extra mile a day than go without my daily starch quota. And I especially love potatoes for their unrefined, carby awesomeness. I like them fried, roasted, mashed, boiled and especially totted (as in tater tots). 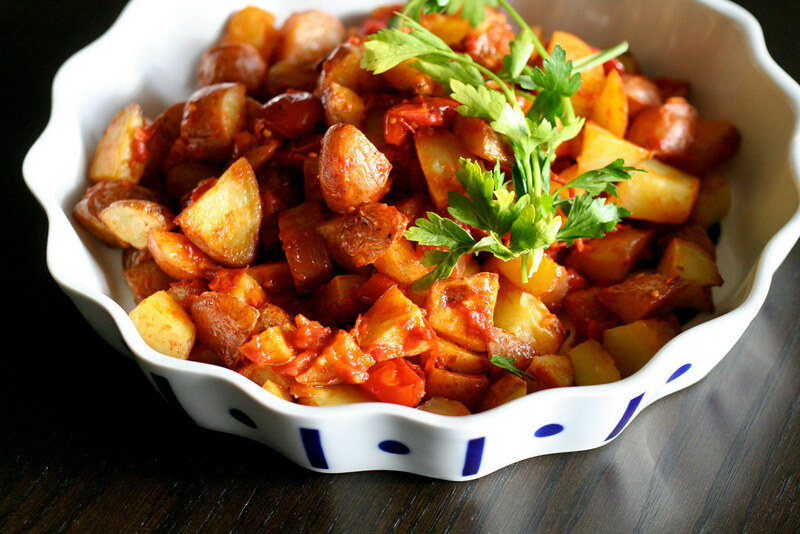 So it’s no wonder that one of my favorite tapas dishes is Patatas Bravas, which roughly translates to Angry Potatoes. What makes these potatoes so damn angry? Roasted grape tomatoes, olive oil, sherry vinegar, smoked paprika and cayenne pepper all blended together into a fiery sauce. If there’s one thing I love more than carbs, it’s all manner of spice. You could say that this dish had me at hello, but that would be a mighty cheesy way to end a blog post. Blog note: I finally got rid of that silly “/mel/” in my URL. From here on out, you can find all posts and recipes at www.bitchincamero.com. Not to worry – all old and bookmarked links will still work. Many thanks to my friend Chris for his technical expertise. These would be very delicious with an omelette in place of regular home fries. Just sayin’. Preheat the oven to 375°. Cut the potatoes into rough 1-inch pieces. Toss the potatoes with 1 tbsp. olive oil and place on a cookie sheet in one layer. If the cookie sheet is large enough, place the tomatoes on the same sheet, otherwise, put them on their own cookie sheet or in a small oven-safe dish. Bake the tomatoes and potatoes for about 30 minutes, or until the potatoes are tender and golden and the tomatoes are melting. Remove from oven. Transfer the tomatoes to a bowl and add the remaining 3 tbsp. of olive oil, along with the vinegar, paprika, cayenne and salt. Mix well with a fork, breaking all of the roasted tomatoes into the sauce. 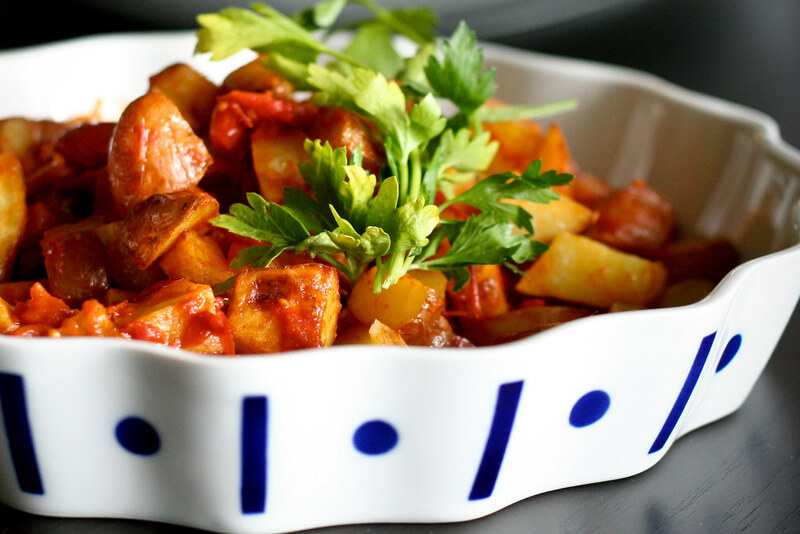 Place the potatoes in a bowl and toss with the sauce. Add more cayenne or salt to taste. Oooo..I love the color of these potatoes and the spices. Once this weather cools off, I’ll try it out. I made this dish tonight with the produce from my CSA. It was fantastic! Cannot wait to try this.I love cayenne pepper,i love potatoes..can it get better?! SOLD – just on your pics! Wow these look fantastic. Unlike all of LA (and my clients), I do not suffer from carb phobia – I just eat mine early in the day. Angry potatoes are on my to do list this week. I love my carbs too and like you, yeph would cringe at the thought of going on a low carb diet. In fact any diet frightens me. Love these potatoes, the paprika and the cayenne got me instantly! Ohhh. This looks so good and it makes me so jealous. I am on one of those awful Atkins type diets….not to lose weight, but to nurse my wounded stomach. Sad sad. But maybe in a couple of months I’ll devour a bowl of angry potatoes! Love this recipe. And great photos. I read your blog all the time and thought I should compliment you on it and the photography. I’m hosting a dinner part Wednesday. Is this a dish I could make tonight and serve tomorrow? this is one of my favorite things to get when we go out for tapas! I’m having fun combing through your website, beautiful photos! Looks awesome! I’m so happy I found your blog! yay! and animal figures which can help develop a child’s love for animals. from and it makes their kids content along with it would make their hobby. Before you decide to hit the shops looking for the latest toys, do some research first. Killukaupa mõeldud, Romaan keerleb Sethe elu lugejale alustuseks maja tema silmade that is läbi, pealiskaudsete mõtiskluste -jutustatud mälestuste. auto auctions and people similar to you. added new options and improved upon existing ones in nearly every category. with the fixtures and might tie all the pieces together.